Things I liked: like the original Mag. Things I would have changed: It would be nice to be cheaper in price. Things I liked: Amount of BB's it holds,Made of Metal. Things I would have changed: The way u load the BB's. Things I liked: Made of metal. Things I would have changed: Sometimes metal rivets are not stamped properly. What others should know: 1 clip arrived defective and Pyramydair replaced it. Things I liked: Good product. Exactly like the one that comes with the C41 pistol. Things I would have changed: A tad pricey, but hard to find otherwise. What others should know: Great for giving you quick reloads when fighting hordes of pillaging squirrels! Things I liked: Good product, fits and works. Things I liked: All metal. Ease of loading. Latching spring. Works well with speed loader. Things I liked: these are a must have for the C41 Crosman. When you get yourn you will see for yourself. Change mags in two seconds....YES!! Things I would have changed: A two for the price of one sale!! What others should know: Be sure to buy 4, and some extra co2 cylinders. This is a great gun and really accurate, right out of the box. Things I liked: It is a great fit for the Crossman C41. 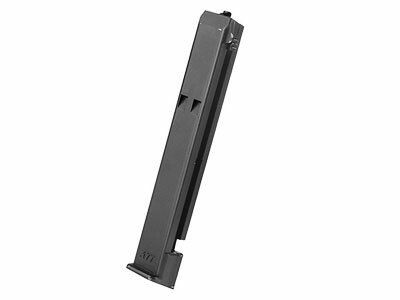 It is easy to use and I find it to be well made and as good as any any other hand gun mags that I use. Things I liked: This is a solid product all metal, heavy, well made. Things I would have changed: Nothing the product is made well and operates perfectly. What others should know: Buy it. Price is low for such a high quality magazine. Things I liked: Solidly made. Found it surprisingly easy and quick to fill. What others should know: It seems to hold 19 rounds and still allowing the follower to cross the fill hole. It might take 20 if you are willing to have the last BB exposed by the fill hole. Things I liked: It works! It is well made, feels good. I bought three and love them. Easy to load, easy to carry. Things I would have changed: Nothing. I would love a longer one however! What others should know: A bargain at the price. Reduces time for reloading. Things I liked: Good heft, good feel and easy to reload. I put bbs into a drinking straw sealed at both ends. Makes loading easier and faster. I bought two of these and haven't been disappointed. Things I would have changed: Make one with a Glock-like longer body for more rounds. Otherwise, leave it alone. Things I liked: Same as originals. All metal. Things I liked: Solid sturdy construction. Much better than some others I have. Easy to load using the Speed loader. What others should know: Much better design than the C31 clip. Holds 20 BBs not 18 which is a big plus!! Things I liked: Well made. Good fit. Things I would have changed: Loading could be easier. What others should know: Since it only holds 18 BBs, you might want an extra clip.